﻿MARSHALL:	Now! Mrs. Bass, uh, uh, when did you come to Ypsilanti? MARSHALL:	Were you married before you came here? You came here—did you-did you and the Doc come at the same time or was he here? BASS:	Oh no, he was here, and I was sick and I went to him as a physician. BASS:	…and he lived in the projects. BASS:	I had a friend there, so, I wasn’t feeling good, so she told me “why don’t you go over to see this doctor—and so then, then we got married and came here. BASS:	practicing a little bit in the evening, and stuff like that. MARSHALL:	Um, you all married when? BASS:	uh, 36 years ago [laughs] this is thirty-sev—’ll be thirty-seven. MARSHALL:	That would be 1944? MARSHALL:	Yeah, 1944, uh-huh. Now, you came here from where? I mean, where is your home? MARSHALL:	Malvern, Arkansas. But then you came here from, you came here from Ohio? BASS:	You see I was born in Malvern. I went to Dayton with my grandmoth—I stayed with my grandmother. BASS:	So we went to Dayton, we went to Toledo, and w—from Toledo back to Dayton, from Dayton to St. Louis, from St. Louis to Fort Smith, Arkansas, from 2:00Fort Smith back to St. Louis, from St. Louis back to Dayton. MARSHALL:	Why all that moving around? BASS:	until I graduated from high school. BASS:	with different kids, and then I went to stay with my mother when I was in Fort Smith. MARSHALL:	Now what was your family name? BASS:	They’re from, uh, Blythesville, Arkansas. MARSHALL:	Blythesville? Well, I’m a, I guess I asked that question out of pure interest. My folks are from down in that area, uh, my mother’s folks are from Arkansas. MARSHALL:	Blands. Nellie [?] and me. MARSHALL:	But, now, they’re from around, now they live around Little Rock, some of ’em. But now, uh, uh, uh, my mother was born in Fort Smith. BASS:	Yeah, well, that’s where I went, first went to stay with my mother. MARSHALL:	When she lived in Fort Smith, and going back and checking census records, that’s—I’m talking about back in the 1870s now, I found all these Blands that, uh, out of my family name, and I was able to trace all of her uncles and aunts, and so forth. and—it’s just a, a side issue. But anyway..
BASS:	And my grandmother’s uh, people had, his, his brother, her brother had the reputation he owned more mules than anybody in the county. MARSHALL:	More mules! [laughs] What did he do, breed them? BASS:	I don’t know, he’s just—they’ve all been, uh, very uh, hard workers. BASS:	You sure that’s all? MARSHALL:	Then the two of you, when you got together, you had uh, three children. MARSHALL:	Is Mike the oldest? MARSHALL:	Mike was number 1? BASS:	Uh, [laughs] March 31, 1945. MARSHALL:	March 31, 1945. And then Ann followed him? BASS:	Yeah. Hers is September second. MARSHALL:	47. Mm-hmm. What’s Ann’s, uh, uh, name now? Last name? BASS:	Now Leah is seven years after Ann, so it must have been 1954. She was born March 1st. MARSHALL:	March 1, 1954, uh-huh. Now, Leah—is she married? MARSHALL:	“Little”, yeah, that’s right, yeah. Now I remember that. And of course, none of them have any children? BASS:	No, but she’s expecting. MARSHALL:	Oh, Leah is expecting. That’s nice. BASS:	[Yeah]. They all have dogs and cats. MARSHALL:	Oh. And, um, now, when you and Doc uh, got married and came to Ypsilanti, I guess one of the things that I’ve heard ever since I’ve been here, but I guess it was emphasized during the um, banquet that was given in 6:00both of your honor—when they were paying tribute to you for what you had done, I heard an awful lot about the contributions that you had made. About your interest in young people here, about uh, look, uh, your, your work with, particularly your work with these young girls. MARSHALL:	And I guess I want to get at that by stating, by finding out, uh, well, first of all, what caused you to get interested in these young people, and then how, how you followed through? In other words, I heard somebody else talk about it, and I want to hear you talk about it. MARSHALL:	I should have gotten that in. BASS:	that if you had the chance to get the education, you owed something. So they used to carry this philosophy: “Education of the heart, the head, and the hand,” and community involvement was just the base—just basic to everything 7:00that you did, uh, even to uh, what you’re going to do in teaching in the classroom. BASS:	else.” And that just y’know, kind of got to be just a part of the fabric. BASS:	And then of course when I uh, when we got married and, and I was here, I was working for a while, for the, what, two days that I didn’t get pregnant [laughter]. I guess that’s not part of the [play]. BASS:	care of them. And, uh, I helped Dear a little bit in the office and that sort of thing, but basically I was home, and I am not enthusiastic about whether you can see out of the windows or not, and that sort of thing, and I can’t stay in the house all the time, and so you have to do something. MARSHALL:	In other words, to keep from going up a wall. [Laughs]. MARSHALL:	You had to find something to do. MARSHALL:	Which center was that? MARSHALL:	What year was that? BASS:	I don’t know these years. MARSHALL:	That’s alright, [forget it]. MARSHALL:	What was the name of that club? BASS:	it was a park. BASS:	and then of course when you go back to teaching, you see the need for these things [in your work]. MARSHALL:	Um, w-back up a little and tell me about this inv—this uh, problem with the Center. BASS:	Community Chest, it used to be. BASS:	And there were a group of women called the Triple, Triple Three, or something, about nine or ten people. Mrs. Goodman, and Mrs. Dorsey, and Ella Morton, those are the three that I remember. BASS:	antagonism there. Well, then during the war, um, they got these funds, 14:00was [Landum] funds or something that was used for community centers, and all of that. And, uh, there was a fight as to whether they were going to accept these funds and the building be taken by the city and the other people take, uh, y’know, give up their money. BASS:	the community center. So, in, they, because it was a community fund agency, they were going to make them give up this money. So they ran off and bought this house upon First Avenue [laughs] uh, where the old club house was. BASS:	it was just nine women. MARSHALL:	Well, that, well, that they were the people who when you were saying when you were using the word “they”—they, are they you’re talking about now? MARSHALL:	Who were involved in this right now. BASS:	No, that, that was, it, it went all the way over to the Ypsilanti Association of Women’s Clubs. MARSHALL:	I see, I see. MARSHALL:	What happened to that group? BASS:	and to go up there and paint! Uh, so we started this little nursery school, and, uh, uh, we couldn’t get any funding from anywhere because certainly it was not really adequate, but it helped to serve beginning purposes. BASS:	And, uh, it was so, it just grew so rapidly that we weren’t able to stay in there more than a month. And we moved to the Center, and of course, 19:00there you had to hide everything and put everything away, uh, when you left in the afternoon. And, uh, it wasn’t really satisfactory, but, I mean, it served the purpose in the daytime. And, uh, so, then, uh, they decided that, uh, it was just intolerable, so, then they moved it to my house—in the basement. BASS:	No, we lived on Harriet. MARSHALL:	Where did you live on Harriet? Is the house still there? BASS:	going toward First Avenue. MARSHALL:	Yeah, yeah, yeah. Mm-hmm. MARSHALL:	You had it in your basement? BASS:	and stay there, y’know, if they went to school in the morning. BASS:	and all—for the play area. Uh, there was fire protection between the big room and, and the, uh, the furnace. So that was all right but it was just downstairs. BASS:	than to just give [why] somebody who where the kids had died because they were improperly supervised. Well, then we got a chance to, uh, uh, to get a house. We wanted—we had this land and property up there on First Avenue. And 24:00that building was inadequate for anything that you wanted to have. BASS:	And we didn’t have any money to do the restructuring. So this house came up down on Washington Street. And, uh, Peter F—we were able to sell. Somebody wanted to buy that uh, house and property. So, we went to Peter Fletcher and he came to one of the board meetings, and uh, then he thought that probably they could loan us the money, and that’s how we got down on uh, Washington Street. And it’s kind of funny—they say that the National Bank doesn’t help and this kind of thing, and maybe they have been pretty strict with, with black people, but as far as the association is concerned, we can’t say a word. MARSHALL:	That was Pete? That was Pete? MARSHALL:	Oh, Kaiser’s the new man. BASS:	He’s the one that’s gonna—always trying to pin me down, y’know. BASS:	And, uh, so, then all of a sudden he quit calling. So, Peter Fletcher, yeah. BASS:	OK, so that’s that. MARSHALL:	Well, that’s interesting. I didn’t—I didn’t know all that. MARSHALL:	I mean, you always know there are problems but you never know the details. Well, then, uh, then I guess the other thing is that I hear, I hear, uh, this, this club, tell me a little bit more about this, this club of, of these kids that I heard about at that affair. BASS:	Well, see, we had a girl scout troop and uh, they were there overnight—and did their overnight sleep things there. And, uh, they just got into a habit of meeting, and even when they got to high school, we never got too many badges, or any of that thing, but we went to all the things. BASS:	and so we’d have these parties in the house, y’know, in the house there. And they were just all around. They were good to me. BASS:	and, uh, so that’s just how that got—and they still, still are very good. BASS:	That sort of thing. But that was the only way to do it. MARSHALL:	You gave, you gave them—I guess the point is—thing that I have gotten out of all I’ve learned about that—I got the impression that here was a group of kids, no place to go, many times, needing somebody to listen to them, needing somebody to sort of guide them. BASS:	Well, you get into that kind of incidentally. BASS:	they had the meeting. I know one time the Eastern Stars were meeting in town for their, whatever it is, y’know, they have, and we said they could use, uh, some rooms while we were going away. BASS:	So that was just the kind of thing that you did. BASS:	and I would have been there alone. MARSHALL:	was what it was doing for you. BASS:	And anything that was done, I think I have been repaid 1,000 times for it because there isn’t any of those kids that I can’t pick up the phone and 30:00call—even to something, to something as silly as wanting a Dairy Queen! BASS:	It sounds, I can call and say, “Gee, I just want…” and the person will say “Oh, you want a Dairy Queen?” [laughter] “OK.” And there’s no, no question. MARSHALL:	Well, in the meantime, during this time also, you also got involved in Brown Chapel. BASS:	Yeah, I joined Brown Chapel when I was pregnant with Michael. MARSHALL:	Yeah. OK. And your first—what were your first responsibilities down there? BASS:	With the Usher Board. BASS:	so it was kind of logical to uh, let’s set up an usher board. MARSHALL:	Except the difference was probably is that I mean, you set it up it 31:00was mostly these young folks. MARSHALL:	I was just going to say, how many of the, of those people are still on the Usher Board? MARSHALL:	Edessa was around then. BASS:	Yeah, Edessa was on. MARSHALL:	Was she on it? BASS:	Uh-huh. And she’s still on. MARSHALL:	Still on. Mm-hmm. Yeah. BASS:	wasn’t, and then he came back. James Moore. MARSHALL:	Oh yeah. Is that the one lives over by me? BASS:	Yeah. I, I can remember when James got married, and then, he was, it was his Sunday to be head usher. Sometimes he’d have to hold little Jimmy in his arms while he stood at the center of the back, and then put him down when he went up, and he’d holler until he got back. MARSHALL:	Yeah. [Laughs]. That’s the little one that just finished high school? BASS:	No, the one, the older boy. BASS:	Jimmy, he finished [unintelligible]. BASS:	And I was on the Trustee Board. MARSHALL:	Then you got on the Trustee Board. BASS:	So that’s that. And then I was on the Finance Committee. MARSHALL:	Did you join under Smith? BASS:	No, I joined under, uh, hm, can’t think of the man’s name. BASS:	He was a West Indian. He’s the one who came when my uh, mother-in-law 34:00died. Knowles. MARSHALL:	Trustee Board and then you got on the Finance Committee? BASS:	Well, Smith the, Smith had been pastor, had been an assistant pastor at Ebeneezer. BASS:	And my aunt and my grandfather attended church there. BASS:	So he, uh, y’know, we knew each other in that sense. And then Peterson, um, my grandfather then moved to Flint and he was Pastor Stewart under Peterson 35:00in Flint. BASS:	with some of those people. Can you cut that off a minute? MARSHALL:	Mm-hmm. [TAPE BREAK] When you were on the Trustee Board, were you ev—were you, were you involved with this new idea that Smith brought here for the Brotherhood Banquet? BASS:	Only from the standpoint that he suggested it, that we have a Brotherhood Banquet. MARSHALL:	You weren’t involved with putting it on? BASS:	Oh, yes, we cooked. BASS:	Ev—ev—when they used to have it, uh, first they started out having it in the basement. BASS:	Uh-huh, I remember that. MARSHALL:	and he speaker was the man that died—the old Presiding Elder. MARSHALL:	Yeah. And what—this I got out of the newspaper. MARSHALL:	And I only have newspaper reports on that, that Reverend Roberts was the first speaker and that it was held in the basement of the church. BASS: did the cooking. Um, and then it was held in the basement of the old high school, [we] did the cooking. MARSHALL:	Yes. You moved from the church to the old high school, and from the old high school eventually to the campus? McKenny? Right? BASS:	I, I, I don’t know. MARSHALL:	The general, the general information I have came from newspaper articles. BASS:	And, uh, also we did the um, this Mother’s Day breakfast with the Usher Board. BASS:	Uh, Reverend Smith was a good pastor in the sense that uh, he was very well organized. BASS:	And the plans that he brought were always well, well-worked out. It wasn’t something like “We’re going to, uh, y’know, build a house over here,” but it was always, “We’re goin—we’d like to build a house over here, and we can do it if we do this and if we do that and if we do it, do the other thing.” And he was willing to work himself. MARSHALL:	Yeah. He was succeeded by, was it Daniels? MARSHALL:	Mm-hmm. Well. We’ll get into another phase of this now. One of the things of course that I picked up is, is your husband’s involvement with many community things—and one of them was the NAACP. MARSHALL:	Now in these days, I also understand he was also pretty busy building 38:00a practice. BASS:	Well, he seemed to always find time. BASS:	And then the Boy Scouts. BASS:	Everything, he would do anything for the Boy Scouts except wear the uniform. BASS:	Had a cub pack down the church. MARSHALL:	and that kind of forced, well, kind of brought to a head his own involvement. MARSHALL:	In order to, in other words, it’s one of those things I used to say that if you’re interested in your own child, you’ve got to be interested in others because the others are going to influence your child. BASS:	And another thing, our kids being around the home, it’s a lot easier to keep track of what they’re doing, if they’re at your house. BASS:	If the party is at your house, you kind of can keep an eye on them. MARSHALL:	where is yours? [Laughs] Yessir. We know the philosophy. BASS:	Uh, Arlene Odum was in that teenage group, and her sister. BASS:	And Shirley, and now Janie’s all in this Girl Scout troop, Janie [and Neachy and]. MARSHALL:	Who’s that? Janie who? BASS:	She sings sometimes in the church. MARSHALL:	Well, you’ve had a great influence on the development of some of, of many of the young people in the community. BASS:	Oh, I don’t know whether you’d call it an influence is you call it a, uh, showing them another side. BASS:	They had to make the choice. BASS:	At least, they could, could see some things. MARSHALL:	Uh, I guess, I don’t want to pull you back too soon, but I want to pull you back to this um, this um, involvement at Brown Chapel. You were on the 41:00Trustee Board and then Daniels came. MARSHALL:	Were you here when they built the—when they changed the entrance? BASS:	That was Reverend Smith. MARSHALL:	That was Reverend Smith, when that was changed? MARSHALL:	And, at the same time they changed that entrance, didn’t they, they also changed the office, didn’t they? BASS:	Well, that was all a part of it. MARSHALL:	Yeah, because before that the office was down front? BASS:	Well, I didn’t know they had any office before that. MARSHALL:	Up over, up on the right of where the choir is? BASS:	Well, that wa—that’s been a store room ever since I’ve been here. BASS:	along with the ladies’ bathroom. Yeah. We had quite a discussion when they put in those two toilets facing each other. BASS:	So, the Usher Board, too, bought the furniture, for in there. MARSHALL:	Well, the, the, uh, the, I guess this involvement with Brown Chapel that led up to your, the name you [led], Trustee Emeritus? BASS:	Well, I just heard about that recently. BASS:	I didn’t know anything about that. BASS:	It’s like Reverend, Reverend, uh, Mr. Wilson said, when they made him, what, honorary trustee or something, “that’s just to make you keep your 43:00mouth shut.” so I don’t know about this trustee emeritus—but I’m very honored. BASS:	Well, that’s where I fell out with—nah, I didn’t fall out, but uh,—I, I don’t know that I’d work too well if had been very active with Johnson. MARSHALL:	Shall we—let’s don’t talk about that. BASS:	Then they told me “I’ve done let you talk long enough.” Ooo! I said, I [felt] I tell you. BASS:	But of course, I’ve had my difficulties with all of them, I guess. MARSHALL:	Well, I didn’t always have the same extent, but, uh, one of the 44:00concerns that uh, has been expressed by a number of people, at least now, has been a matter of uh, of uh, accessibility. And, uh, as, ’course, the church is, I was, I was able to secure the designation of Brown Chapel as a historical building, ah, but on the other hand, that does not rule out, ah, some kind of alteration which would make it more accessible. Now, I’m not just thinking about somebody who may have difficulty because of, of, of, of their being in a wheelchair, or that kind of thing—I’m also thinking about people, well, Mrs., Mrs. uh, Clark…when she was coming. And, not only that, but Mrs. Williams now. Genevieve. These people, who, when they get old—they have a 45:00difficult time getting up those steps. And I, I looked at that and I said, “Well, someone around here needs to be concerned about accessibility. Now, how—we’ve mentioned it to, uh, Reverend Wilson. Well, he’s interested but he’s not going to be any more interested than we are, really. And I guess I’m concerned about it. I think that we ought to be interested, we ought to—since the church seems to be doing well now, so far as finances are concerned, we’re bringing in an average of 1,000 a week. Can you remember when we were up there begging for, trying to get 500? BASS:	Well, I can remember when 300 was a good [take]. MARSHALL:	Yeah, yeah. And under Johnson, we were begging for 700. And now, if, if we don’t bring in 1,000 a week, something’s wrong. And then we go out here on, on the um, anniversary, we raised almost 2,200 on the anniversary—and that’s extra. BASS:	Well, I’m concerned that the Brotherhood Banquet was, uh, supposed to 46:00be a non-profit. BASS:	And I think that if it’s going to be a non-profit, and if you’re going to get any money off of it, then that money should not be put in the general treasury for general funds, but that something, uh, specific—uh, toward building race relations should be used with that money. MARSHALL:	I’m glad to hear you say that, because this has been a pet peeve of mine. MARSHALL:	Yeah, I don’t buy it either. But this is, see, we lost out on that when Johnson was here. I kept saying that, and Johnson had other ideas, and nobody, well, these people just don’t stand up for anything, and so, as a result, it’s being used for everything now, and I don’t buy that. I have felt that it should be dedicated to what it was set out to do. Well, anyway! How do you stand on that? MARSHALL:	Well, probably, probably, probably when Reverend Smith was here, he was, maybe there wasn’t quite enough money to go around or something like that, but now I maintain there is. BASS:	Do you pay his social security? MARSHALL:	No, we don’t do that any more. We don’t do that any more. BASS:	Do you pay the insurance? MARSHALL:	Also pay that church insurance. BASS:	We had some trouble with uh, um, well, I said I don’t believe in buying them suits and giving them those things, and Reverend Smith said, “So you 48:00don’t want to buy me a suit?” I said “No.” And he he pointed out that at that time he used to use his gas and going to see the sick and handing people a piece of money when they needed it, so I—and that’s why we, we started that 10 dollar a month travel. MARSHALL:	Well, we give, we give him 100 dollars a month. MARSHALL:	We give him 100 dollars a month travel. In other words, he gets $1,200 a year to buy gas with, and that’s low because when he goes on a long trip, that’s extra. BASS:	and, I mean, the amount that he would ask for, I always felt was too low because he couldn’t get a room. I asked him if he was going to get a room down there, y’know, where the toilet’s down the hall or what? And when he went to 49:00the General Conference, he said, when the car broke down, that’s the first thing he thought about, that I, what I’d said. MARSHALL:	[Laughs] I remember that. BASS:	Uh, see what’s actually going on and you can’t really get a feel for it unless you’re there. MARSHALL:	your best, or selecting at least from your best people to go as delegates. Now, the rea—when I say that, is, uh, when I was going to the conference, for example, as a delegate, um, I was getting on important committees, I was sharing committees, I was putting Brown Chapel on the map. MARSHALL:	I chaired committees that had never been chaired before by laymen, under, under [Pringle]. MARSHALL:	Do you know who the chairmen of your local, of your current historical committee is? We’re getting ready to celebrate a bicentennial—in 87? I’m the state chairman—Brown Chapel! BASS:	Yeah, well, these are the things that they just don’t, uh, look into, I think that you have to send people who can talk. BASS: and who work hard, but to be a part of the total thing, you need to know what to do. MARSHALL:	Right, [?] Well, um, let me see, the other thing I wanted to ask you, now, in the years you’ve been here, have you been involved in much, uh, in, in, you told me about some of it, but have you been involved in any other thing concerning city politics, city goings-on, and so forth? MARSHALL:	Anything that would make you go to city council meetings? BASS:	Oh yeah, I’ve sat down there in council meetings lots of times. When we uh, were talking about that nursery school, that building that’s in the back there, it used to be a nursery school during the war when it was federally funded. And, uh, when we had to move out of First Avenue, we asked the council to let us use a portion of that rental office for the nursery school. It was set up with all the requirements, and then we said, and, uh, so we wrote a letter to the City Council about it, and they had to go to Chicago, and they had to write to this and that and the other but thing that it boiled down to they didn’t want to do it. So I sat at student council meetings uh, the whole summer uh, asking y’know, “What is the decision?” And, uh, it ended up with, 52:00y’know, my having to tell them that I understand what the problem is, if you didn’t want it, why didn’t you say so. Why weren’t you man enough to stand up and say, “we don’t want to let you have that,” rather than telling all those lies and going around [unintelligible] over there? Which, uh, didn’t—I mean it got to be the place, one time I took Ann or Reba to register because they’d gotten to be 18, er, 21, and uh, so while she was standing in line, I just went up to council meeting. They couldn’t believe that I didn’t come to raise Cain about something. And, uh, you know. MARSHALL:	During those days, now, during that time, who was on the council representing the first ward? Bass:	really. I was not too involved before that. And uh, they, the first, uh, 53:00change of the charter to make it a city-wide thing. Uh, I think it was in everybody’s mind that the person who got the top vote would be the mayor. BASS:	Well, Amos Washington uh, ended up with the top vote which messed up the whole plan. So that’s when they started to electing them. It was a miscue, because the black people were pushing for a black man in there, and the white people were pushing for a, a, “middle-of-the-roader” in there, and the two combined made him have more votes than anybody. BASS:	And then there was, uh, the next person was Seymour, who uh, uh, ran, Frank Seymour. MARSHALL:	You sure about that, now? MARSHALL:	Seymour, I got it Seymour was number one, and that Washington succeeded him. BASS:	No, Amos Washington was the first person. MARSHALL:	Amos Washington was the first school board member. BASS:	Am—no, no…Amos Washington wasn’t the first school board member. MARSHALL:	No. No. He was the second school board member. BASS:	and then Seymour was on, and then Burton. And, uh, these were all while it was a city-wide thing, and they used to have a civic club with, uh, Julia Vanslyke’s mother, and Mashatt, and Dorsey. A lot of these people were in it who worked for registration and voting, also Myrtis Stinson. So I used to work with getting out the votes, and manning the stations where you called people to 55:00vote, and that sort of thing. Then with the, uh, school board—uh, being active in the PTA area, where my kids were, and we had quite a hassle for the new addition to Perry. BASS:	And that’s always a question as to whether they wanted the addition to concentrate on blacks or whether it was because we needed it, and we got it. BASS:	Uh, y’know, so. That’s where I fell out with uh, Beth Milford and Errol Brown. Beth thought she was going to use me, and I was using her for information. BASS:	And, uh, that’s why they didn’t hire me at first as a teacher. Uh, she…the other thing that she got angry about—there was a nursery school down in Woodruff School, and uh, I was on the Community Fund Board. They came up for 56:00their allotment. Well, I felt that they should keep it open and [ship doe], some of the people were against it. But then she got the union to write a letter stating that if they didn’t keep that open, they would withdraw their support of the Community Fund. Well, I changed that, and decided that we would not do it because once you bow to the largest contributor, then you’re controlled, and that’s where we came to a parting of the ways. BASS:	Because she no longer had me where she thought she had me. I had just to go against her because she forced the hand, and then she got Amos Washington, and she and Errol Brown, uh, thought that because Amos and I did not get along that he would go along with them in fighting my application for a job, and so 57:00that was the next, uh, uh, surprise to her. MARSHALL:	Did he support you? BASS:	And so, the whole summer they refused to hire me, and um, with all these reasons, and this, and, uh, then they wanted to hire me on a substitute basis and I said, no, that if there was something in my background that was not satisfactory, they should tell me so, though I knew that as a teacher I would not take a substitute pay. And that was when the seventh and eighth grades were in Perry School because the buildings were not finished. BASS:	So the teacher that they hired lasted five weeks. And Joslin came in and Ann was in that group, and uh, so, the superintendent and, and uh, Joslyn said 58:00for the sake of the kids, would I at least take the job until Christmas? So that’s how I got in the system. And she used the thing that uh, I would teach for the black kids. Well, it happened that, uh, Mildred Harris was also on the board—uh, Dr. Harris’s wife, and she didn’t like Beth either, they had two doctors’ wives had a controversy. MARSHALL:	Oh, Ardis, oh, Ardis, A-R-D-I-S.
BASS:	and the Porter was the Business Administrator and, um, Ardis supported the, Ardis supported the [man], the demands for the school. And uh, a lot of 60:00things had been cut out and initialed by the principal. This is the reason why they didn’t get it, and Ardis was nice enough to show this to [me]. Then the, the PTA bought the P.A. system for Perry School. And uh, we invited Porter to come over there, first time he’d ever been invited to anybody’s meeting. So, from that, he fixed the kitchen and everything—so that was my work for the school. MARSHALL:	Uh-huh. Now, the new man that came on after Ardis? BASS:	and the next year they kicked him off the staff. Then they went to court and they had to put him back on. MARSHALL:	Well, they had to put who back on? MARSHALL:	But now, how long did your husband stay off the board? BASS:	that’s an elected thing. MARSHALL:	Yeah, but you said that they kicked him off the board. BASS:	Well, they didn’t vote him back on. MARSHALL:	oh, I see, I see, yeah, I see what you mean. BASS:	He just wasn’t elected to office anymore. MARSHALL:	Yeah, yeah, yeah, yeah, yeah. Of course, I think when I got here, Milford was still off the staff. BASS:	I think they had to put him back. MARSHALL:	They did? Well, he nev—I, I picked up on something when I first got here, and that was that his reputation was not too good but I never really knew why. MARSHALL:	Um, [laughs], um, oh yeah, one—let me back up a minute. Now when you 63:00tell, when you telling me all this about your difficulties getting on the school board—getting on teaching, how many black teachers did they have? BASS:	and uh, they went to places where the kids couldn’t swim—black kids couldn’t swim. So, um, we ran a meeting on this moral and spiritual things, 64:00you know. And uh, so, I asked did they go—that’s when Wilsey was the principal—did they go places where black people couldn’t go, and he said, “Well, this, uh, there was no place that they could go, that the kids could—” I said, “Well, better stay at home,” and uh, so then we started this discussion that uh, either they go to a place where all kids could participate or not go at all, and uh, that’s when I was told by one of the leading educators that if we go enough, they would learn that black kids knew how to act and then they would open up. So I said well, I resented the fact that my child had to prove he knew how to act and nobody else’s did—so that kind of began the broke, the breakdown and that’s what began to label me as a 65:00troublemaker [sister]. MARSHALL:	(Laugh) I, I laugh, Mrs. Bass, because the, the one thing I guess I’ve learned is what was going on in Ypsilanti before I had ever heard the name is really a reflection of what was going on everywhere else. [Laughs] The uh, Human Relations Commission—now was your husband that served on that? I was thinking it was you. BASS:	He was the first chairman. MARSHALL:	He was the first chairman. MARSHALL:	[Laughs] Was that when my good friend, probably shouldn’t say that, Walter Erickson—was uh, was he involved in it? In its beginning? BASS:	I think he was. I think he helped or something. MARSHALL:	Well, when I came, I learned, that was one of the things that I learned—that he was, had been a member of the Human—Human Rights Commission. BASS:	Well, I don’t think Ypsilanti kept up at all. MARSHALL:	In other words, you had to fight for every inch? BASS:	and it had happened to be a joke. BASS:	So I, I think, uh, every step of the way, has had to be pushed. MARSHALL:	Were there any persons who stand out in your mind as say, quote, “friends of the blacks in the community” from their practices, attitudes? BASS: Blackburn. His wife was quite active in politics and uh, movements. Francis Young was quite active in girl scouts because we had problems. Girl scouts used to all go to camp at the same time, the black ones, and uh, uh, we thought they ought to be able to go anytime they wanted to, like, uh, the people wanted to go. BASS:	And Marie Arnett, who’s an old lady who had worked in, in the, with girl scouts—she was a cook out there at the camp—and uh, uh, who pointed out this thing that was being done. BASS:	And uh, uh, oh, what’s his name—he was with the real estate who sold us this house? Um, hm! I can’t think of his name. He was taking his daughter to camp and the Hollifield girl was going, and they were to room together, and 69:00he didn’t believe that this should be. And uh, so they suggested that maybe he ought to take this child home. MARSHALL:	That wasn’t Hughes, was it? MARSHALL:	That’s all right. That’s all right. BASS:	the phone book. And uh, uh, It ended up that the girl and, and Doris Hollifield became the best of friends, and that broke down that. So, Francis Young and this Marie I met, uh, I think, uh, stand out to me. Um, there are probably some but they just don’t come to my mind. MARSHALL:	Well, another question that on—that comes to my mind also—somehow I picked up some things about discrimination in, say, bands, musical groups, 70:00this kind of thing, even though they were integrated. BASS:	In the Drum, Drum Corps, um, there were never any black girls chosen. And, uh, then let’s see, Peggy Neely uh, was finally, and the Horne girl were finally picked. Rh, of course, then Jane Rivers’ daughter, Margaret Eaglin's, Val, and Ann all came through at the same time, and all made the application. And the requirements were that they had to have good grades, they didn’t have to play a musical instrument, but they had to be, y’know, a, a certain height and a certain weight, and had to have good grades, and somebody said ‘attractive.” So, my daughter had the right height and she, um, had the 71:00right grades, and she had, she had the added thing of playing the drums, and I wanted to know which one on there was going to tell me she wasn’t attractive! BASS:	So they let Jane Reyberg, whose daughter’s white—they didn’t want her on there ’cause Jane raised, raised Cain so much, and of course Margaret, it was Val, and Ann were black so all three of them made it. And so that was, that was something you had to work on to break down. BASS:	Uh, you had to break down, uh, places to eat. I took the girl scouts on a walking tour, and when we came back, there’s a little old greasy spoon next to the bus station and we were just going to stop and get some pop—then they wanted us to sit at the back of the place, so everything has been, if, if you don’t work, you don’t get it. There are a lot of pretenders that they’re 72:00interested in the, in the progress of the blacks, but they aren’t. MARSHALL:	While all this was going on, then, I guess the one hundred dollar question that I have is what—how much backing was coming from the local community, I mean the black community? Were they passive about all of this? Accepting all of this? BASS:	Well, it seems to me that there’s a situation where there were certain leaders who uh, uh, who spoke for the black community, and it’s always been my impression that these particular chosen leaders were very uh, passive, and uh, we were not the passive couple. Uh, we were supposed to…uh, so they never knew which way we were going. MARSHALL:	Then you did have the, the, the so-called white leader, selected by 73:00the white folks, not white leader but white spokesman? BASS:	if they wanted to know anything, they’d ask Amos Washington, Gene Beatty, or Jesse Rutherford. BASS: Which Neely? Ben Neely? MARSHALL:	Was what? A maverick? BASS:	Maverick. No, Ben didn’t fall in the same category with them. BASS:	who did well, and did some things and caused some things to be accomplished, but, uh, in his way. BASS:	And I don’t think he was uh, accepted as a so-called leader, but he was 74:00kind of a maverick. BASS:	Now see, you ask me, you put a year to it, and it doesn’t mean a thing to me. BASS:	As far as Eastern is concerned, uh, uh, I don’t know a lot about it. MARSHALL:	Well, no, I’m not asking about Eastern—I was just wondering if you remember any community involvement? BASS:	and contributed their services. But so far as the um, black faculty is 75:00concerned, that had, I would say that their effect on, on uh, uh, Ypsilanti was nil. MARSHALL:	Well, that interests me because uh, that, that, that, those, those, those so-called pioneers on the faculty that were here even before I got here…it interests me because I would have thought that the very forces which made it possible for them to get jobs on campus would make them active in the community. BASS:	No, it hasn’t, really. MARSHALL:	For example, with me. BASS:	Neither from the, uh, from the University of Michigan, [I can’t] really. BASS:	and I may be super-critical because of that. MARSHALL:	Well, I, I guess I’m sensitive to it, because when I came, I noticed the same thing. Of course, I didn’t come until 69. But I noticed the same thing. And I guess the thing that I felt was, that, uh, well, when I came, I said the thing that made it possible for me to be at Eastern were all of the things that went on beforehand. The Human Rights Group, the uprising of the students on the campus, now that’s, when I really go back to it, that’s the reason they wanted me, I know that. [Laughs]. So, I guess when I got here, the first thing I did was to start affiliating, and I—’course, Brown Chapel, number one; Business Professional League, number two, and I mean, and then fighting the fraternities trying to get them to become involved as I felt they should. But, it, the question always, well, I guess, the thing that was always in my mind, there were all these people who had been here and were so proud of 77:00this place, and they felt that, uh, and, uh, they, they, they soon like got the feeling that people just wanted them here period! And I [was], I never felt that. BASS:	Well, the thing that Eastern held for is that it provided some jobs. BASS:	Mm-hmm. That’s about it. MARSHALL:	Well, that’s interesting. Now, the other thing I want to—let me, let me back up, and back, back on this one too—I want to get a, kind of an e—evaluation of the time that you’ve been here of Brown Chapel as a community service. BASS:	Uh, I think that community service involvement with Brown Chapel went up very much when Reverend Smith was here, and has declined ever since. Well, you asked me! BASS:	I mean, Reverend Smith used to get into everything. BASS:	that churches should have on the community. WOMAN'S VOICE: Yes, she is. Her name was Lisa? BASS:	Yeah. Where’d she go? Lisa! MARSHALL:	Getting to the end now but I do want to ask you, uh, having lived here since 1944, and having seen many changes take place, having been a part of, or played a part in that change, uh, what kind of a future would you like to 79:00see? What would you like to see happen, say in the next 10-15 years? BASS:	because I’m concerned about the attitude of the general young people, and particularly young black people toward responsibility to the community and to the other people in the community and their development. And I think that the hours that we spent working with those, young, uh, kids—uh, I don’t think they’re paying back by putting in that amount of time with theirs. I realize that the situation is different. The economic upheaval means that they have less 80:00time to put, but I don’t think they put as much as they can put, and the, uh, high school groups coming along are not working up to their ability. MARSHALL:	Why do you say they have less time? BASS:	Because they have to spend more time scrapping out a living. With the cost of living and the amount of money that is needed to run the home—they, they have to spend more time than what we did. Because many of us were working in a private family, and Miss Jones said if this was your day to do so-and-so, you could get off. Uh, the women are working in factories and they don’t let you off to go have your club meeting or to give your church dinner, that kind of thing. They are—the job requirements are more structured, and so that they 81:00don’t have the leeway, but then I think that the very fact that they were able to get those jobs means that somebody pushed for them, so they need to spend less time, uh, socializing and more time then trying to work it. MARSHALL:	That’s an interesting, that’s an interesting point of view. Uh, I have to, I have to agree to that, tend to agree with you there, [phone]. I have concerns, I have some of the same concerns, by the way. Uh, this lack of concern of many people about their fellow man. Uh, it it exists in the church, it exists outside the church; it exists particularly among those who happen to be a little bit more fortunate. You see, you and I came out of similar schools. MARSHALL:	I mean, I think in most black schools there was that kind of an indoctrination. MARSHALL:	I have a feeling that much of what we’re missing is one of those unforeseen results of integration. BASS:	and the, and the, the fact that being prepared. MARSHALL:	And if we cannot expect the white teacher in the school to do it. MARSHALL:	You wouldn’t put it on a racial basis. BASS:	white as I do with the poor black. And, uh, I don’t have, uh, [bear] and I don’t agree with it. MARSHALL:	I would, I would, I, I, I, I, I, I, I can follow you, I follow you on that, but at the same time, I think with many of them, they still let the matter of prejudice get in the way. Now, I would, for the most part, I would agree with 84:00you, that it should not be and is not necessarily a racial problem, but I do feel that some people are letting their prejudices get in their way. BASS:	Well, both black and white. MARSHALL: be more vicious in our prejudices. BASS:	But I think too long we’ve used that as an excuse. BASS:	teachers don’t speak up about it. For example, some kids were found with marijuana the other day. BASS:	Now, I didn’t hear about it until the next day. BASS:	Had that been a black kid, I would have heard about it in the teacher’s room right off. BASS:	There’s these little things. BASS:	room. Well, then somebody told me about this white parent coming over raising hands and using all kinds of language about the bus situation. MARSHALL:	[Yeah, any] like that. BASS:	And so we ended that discussion, but if you don’t speak up, and some of them don’t or are not too aware, but somebody has to make them aware of that 86:00situation. I’m tired now. MARSHALL:	from the black community down there. BASS:	I said, “Even when you know what you’re doing, you get messed up if you’re black.” I know it got back to him. Partial Transcript: ﻿MARSHALL: Now! Mrs. Bass, uh, uh, when did you come to Ypsilanti? MARSHALL: Were you married before you came here? You came here—did you-did you and the Doc come at the same time or was he here? BASS: Oh no, he was here, and I was sick and I went to him as a physician. Segment Synopsis: Mrs. Louise (Lane) Bass gives A.P. Marshall a brief history of her family and how she came to Ypsilanti and married Dr. Thomas Bass. Hyperlink: Dr. Thomas Bass' November 22, 1997 Obituary from the Ypsilanti Press. Partial Transcript: MARSHALL: Which center was that? Segment Synopsis: Mrs. Bass details some of the history of the Parkridge Community Center, and some of the many church and community clubs she was involved in, including the Palm Leaf Club. Mrs. Bass also talks about the efforts to establish a community nursery to serve Ypsilanti's south side African-American neighborhood. Subjects: African Americans--Social life and customs. 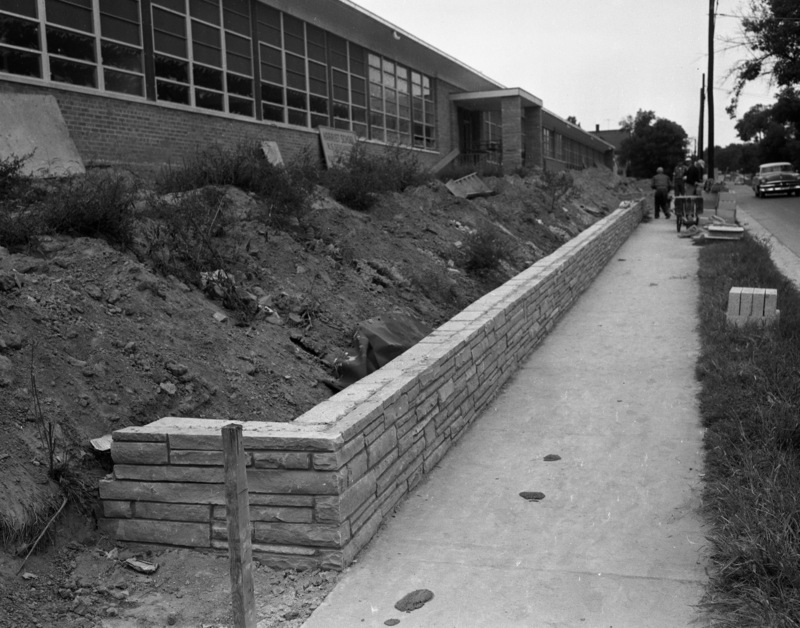 Hyperlink: Circa 1955 photo of Ypsilanti's Perry School. Courtesy of the Ypsilanti Historical Society. Partial Transcript: MARSHALL: Well, in the meantime, during this time also, you also got involved in Brown Chapel. BASS: Yeah, I joined Brown Chapel when I was pregnant with Michael. MARSHALL:Yeah. OK. And your first—what were your first responsibilities down there? Segment Synopsis: Both members of Ypsilanti's historic Brown Chapel AME church, A.P. Marshall and Mrs. Bass have a long discussion on the various pastors of the church and the issues facing the congregation. Mrs. Bass talks about her many roles in the church and gives her opinion on several pastors and some of the controversies and challenges the congregation faced. 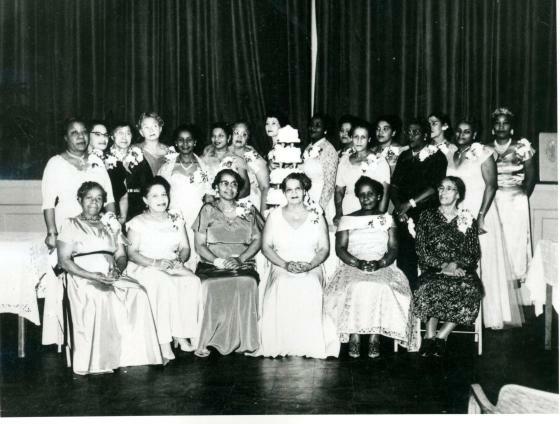 Hyperlink: The Palm Leaf Club, circa 1954. Partial Transcript: MARSHALL: Well, um, let me see, the other thing I wanted to ask you, now, in the years you’ve been here, have you been involved in much, uh, in, in, you told me about some of it, but have you been involved in any other thing concerning city politics, city goings-on, and so forth? MARSHALL: Anything that would make you go to city council meetings? Segment Synopsis: A.P. Marshall asks Mrs. Bass about her involvement with local politics and city government. Mrs. Bass details her various struggles and positions over issues affecting her work and the community. Mrs. Bass also relates how she was hired to be a teacher with the Ypsilanti Public Schools. Subjects: Political participation. African American educators. 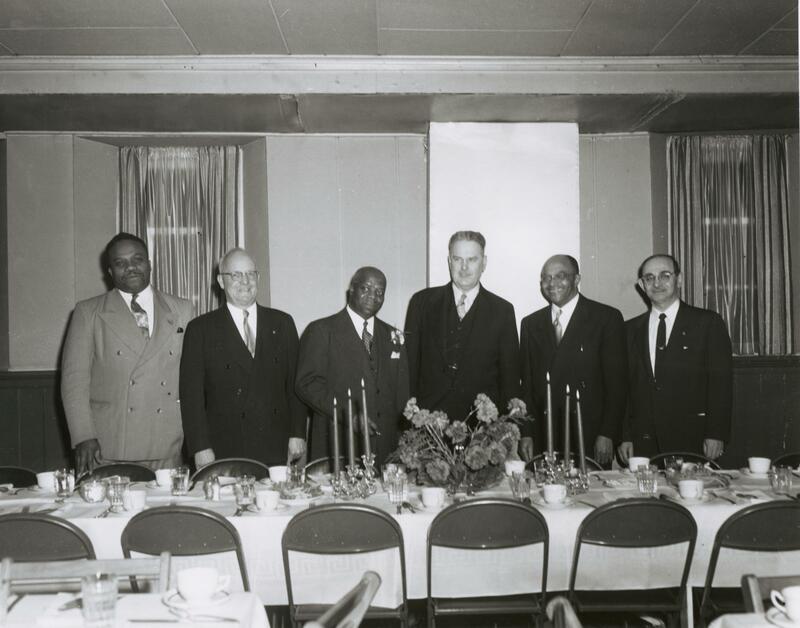 Hyperlink: Photo of the Brown Chapel sponsored Brotherhood Banquet around 1950. Courtesy the Ypsilanti Historical Society. Partial Transcript: MARSHALL: Oh, Ardis, oh, Ardis, A-R-D-I-S. Segment Synopsis: Mrs. Bass elaborates on the discussion of her experiences with Ypsilanti Public Schools and her struggle to get hired as a teacher. She also talks about her role in the Parent Teacher Association and her struggles with the School Board and her husband's tenure at Beyer Hospital. Subjects: African American educators. African American physicians. 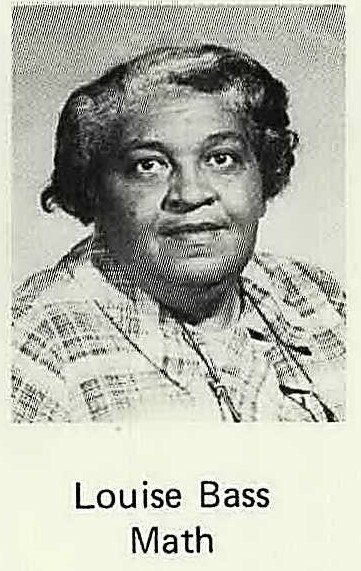 Hyperlink: 1972 Ypsilanti High yearbook photo of Louise Bass as math teacher. BASS: Well, I don’t think Ypsilanti kept up at all. MARSHALL: In other words, you had to fight for every inch? Segment Synopsis: Mrs. Bass is asked about her view of how race relations and the situation of Ypsilanti's Black community has changed, or not, over the forty years since she arrived in the city in the 1940s. She discusses some challenges she sees facing the Black community and how the issues of poverty need to be addressed in all communities. Hyperlink: Listen to A.P. Marshall's interview with Ben Neely.